Some sites get all the traffic. How do they do it? Are they publishing more? Are they just famous on social media? Is it email marketing? How? There’s mostly one difference between high-traffic and low-traffic websites. Here it is: sites with big traffic have pages with information that people are looking for. That might sound simple, but it’s not. This post is going to lay out all of the steps to make one of those high-traffic pages and how to make it visible to the people who are looking for it. Here’s how to increase targeted website traffic in 10 steps. We’ll use the example of the bicycle handbag company, Po Campo Bike Bags. Fair warning: it’s a lot of work. But it’s worth it! You can write a truly great page on the topic. That means you’re an expert on the subject. You probably have strong feelings about it. Your eventual goal will be to create the best page on the internet for the topic. It should be broad enough that to cover it thoroughly, you’ll be writing several thousand words …without adding fluff. It’s useful to your target audience. It may be only indirectly related to your business, but it must be directly related to your audience. It connects with their concerns and fears, hopes and dreams. The ideal topics are those that don’t go out of style, such as how-to instructions, resources and answers to questions they’ll be asking next month and next year. Resource: Looking for a search-friendly blog topics? Read What to Blog About: 13 Sources for Fresh Blog Topics. Ask yourself: If I were looking for this article, how would I search? What words would I use? What phrases? Getting in the mind of your visitor-to-be is the key to increasing targeted traffic. Empathy is everything in marketing. Avoid jargon …unless your audience really uses it. Stick to phrases that are three to five words long. Consider phrases that are complete sentences or questions. Write down your list on paper, in a spreadsheet or directly into your writing template. Each of the article ideas can be aligned with a possible keyphrase. The headline and article will eventually be shaped around the phrase, but stay true to the topic. The goal is to make something valuable that your audience is looking for. The authority of your website determines the general likelihood of ranking. Make sense? If not, here’s a short animation that explains how links work in Google. To find your Domain Authority, visit Link Explorer and enter your domain. The free version can be used a few times per day, but you just need to use it once. Domain Authority changes very slowly over time. Don’t worry about a high or low number, just look it up and write it down. Link Explorer will also show you the number of websites that link to you, the total number of links and the quality of the top links. Now we’re going check on our phrases. 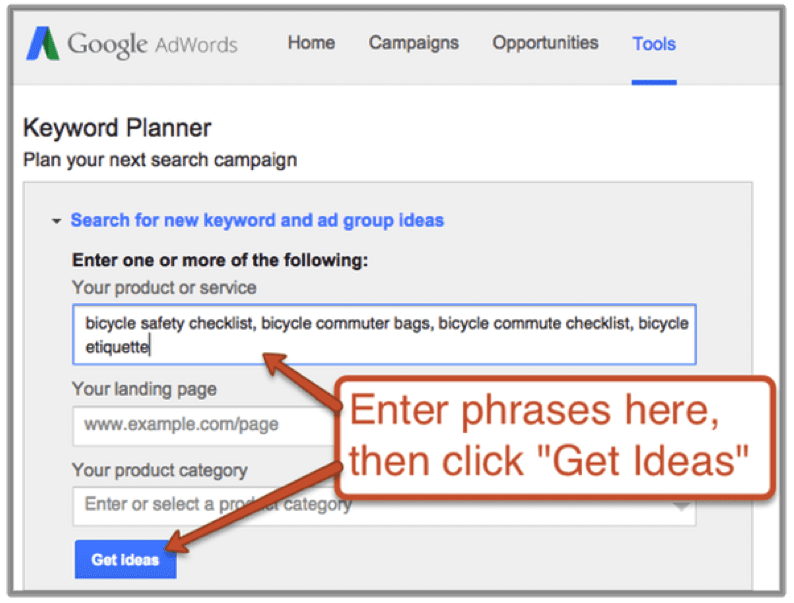 There are many tools for keyphrase research, but the Google Keyword Planner is the place to start. Enter several keyphrases into the box, separated by commas and click “Get Ideas” at the bottom. Next click the “keyword ideas” tab in the center of the screen. 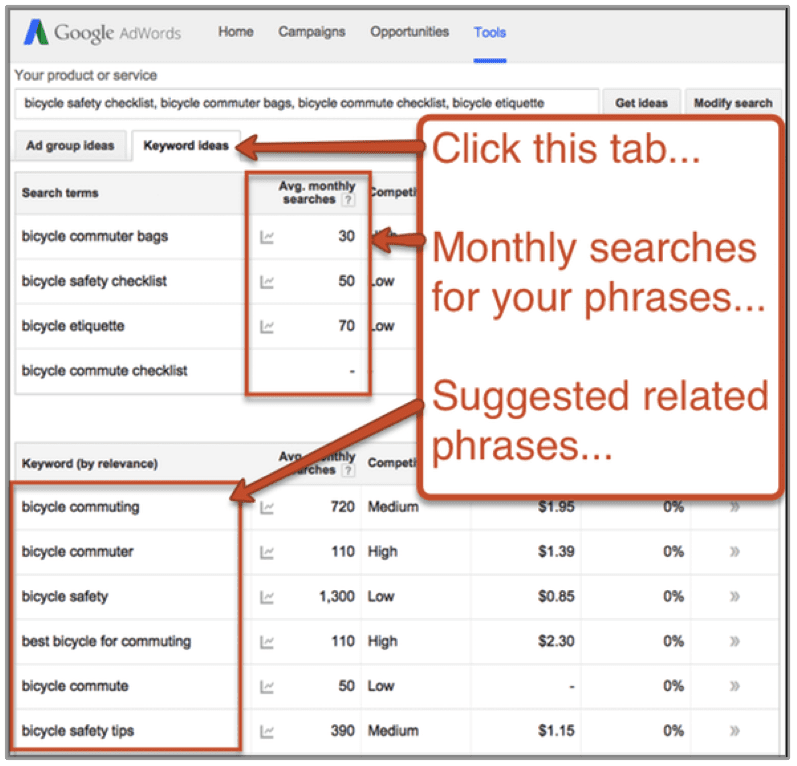 Now you’re seeing the average number of monthly searches for each phrase. If there’s a dash rather than a number, that means there are fewer than 10 searches per month on average for that specific phrase. Caution! The specific numbers here are actually not that important or accurate. Within this tool, Google is only showing rounded-off “exact match” numbers. That’s the number of times the exact phrase was searched for precisely as if it was in quotes. The number of people searching for a general topic is always much higher. Below the numbers, you’ll see a list of up to 800 related phrases. This should get your gears turning! Keep editing your list and checking more phrases. Are people actually searching for the phrase? What is the general order of magnitude for popularity? Dozens? Hundreds? Thousands? What other phrases might be even better? See that competition column? Ignore it. That’s just showing competition for AdWords advertising. Our focus here is organic search, not pay-per-click. Later, we’ll check the specific competition for these phrases, but for now, we can start filtering. 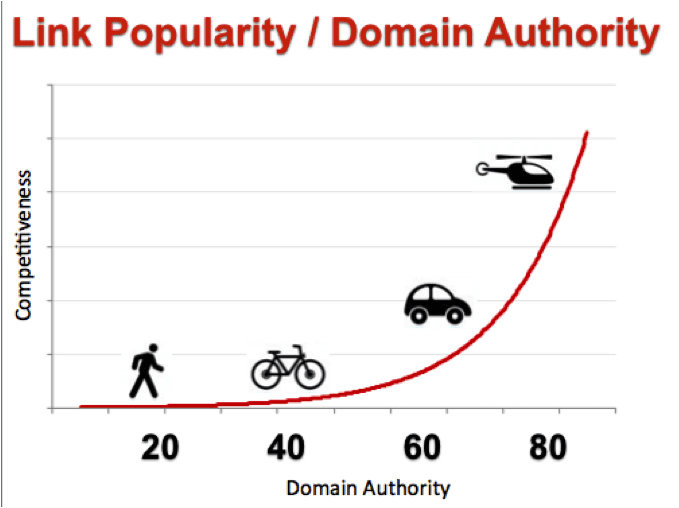 If your Domain Authority is low, you’ll likely have trouble ranking for popular phrases. These are just guidelines. We’ll check competition in a more accurate way in step six. Still, if you’re way outside the ranges on this chart, go back and start again. Now let’s actually search for the phrases we’re considering targeting. Log out of any Google accounts and plug in the first phrase into the search box. If someone searching for your article found these search results, would they dig in and click? Or would they feel like they’re on the wrong trail and search for something else completely? Is there a lot of visual noise? Google keeps adding more to search results pages, like ads, products, images, local listings with maps, info boxes, etc. It’s called “universal search results.” Look carefully to see where the top-ranked page is. Is it buried under a lot of other stuff? These visual elements are distracting and would make a successful effort less effective. Has Google bolded related words? If you’re in the wrong neighborhood or if there’s lots of visual noise, go back and try other phrases. Now we’ll really check competition. First, you’ll need to add the MozBar to your browser. It’s a Chrome Extension and Firefox Add-on. Once added, you’ll see a little ‘M’ next to the address bar in the top right of your browser. Search for your phrase again in Google, then click it! Now you’re seeing the “SERP Overlay” (SERP stands for “search engine results page” and it’s the geekiest jargon in the industry). MozBar is showing you the link popularity data for all the high ranking web pages. In other words, it’s overlaid the Link Explorer information, including Domain Authority. If our Domain Authority and the Domain Authority of the high ranking pages are within the same range, then we’ve got a chance. Ideally, the Domain Authority of your site is in the range between the highest and lowest Domain Authority of the pages that rank on page one for the phrase. Think of it this way; your site is a runner, a cyclist or a driver. And every keyphrase is a marathon, a bike race or a car race. Don’t expect to win a bike race on foot or a car race on a bicycle. But if you’re on a bike, you’ll win every marathon every time. If you’re below the range, then the phrase is too competitive for you. Go back and start again. 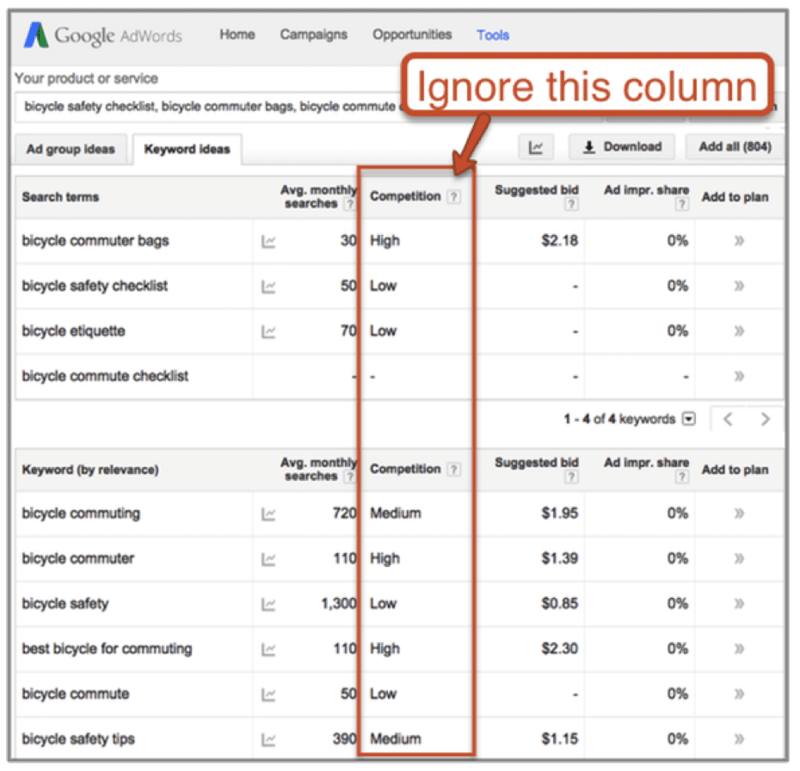 If you’re within the range, you’ve just found your target keyphrase. Here’s where the magic happens. Pour your heart and soul into it. Be concise in your language. Go deep into details. Give away your best advice and polish it with care. These three factors are deal-breakers in creating pages that pull in targeted traffic. Length: The article should be long, not because it’s fluffed up but because the topic is big. Detailed articles tend to perform better in search engines. Learn more about the ideal length for blog posts. Formatting: Never write long, blocky paragraphs. Use sub-headers, bolding and bullet lists. It should also have images, diagrams, even video. Use this a checklist for web content. Headlines: Clever but unclear headlines don’t get clicked or shared. Use this checklist for writing headlines. Remember, this will eventually be read by thousands of people. Write something epic! You’ve written a stellar piece of content. It’s time to make sure it’s aligned with your target keyphrase. Targeted traffic comes from a page that zeros in on its topic deliberately. Since you picked the phrase before you began writing, you likely had it in mind and used it several times. Let’s go back and check. Once in the <title> tag, ideally at the beginning. That means putting the name of your company at the end of the title tag. Once in the <h1> header. This is often the same as the title, but not always. Four to six times in the body of the article. In a 1000+ word article, you probably used it at least this many times already. Try to keep the phrase together with all of its words in order at least a few times. Use synonyms and related forms. If you noticed bolded related words (indicating semantic linking) in search results during step five, make sure to work these into your article. The goal is to indicate the relevance for the phrase. Do not cram the phrase in there. Keyphrase stuffing is spam. Just use the phrase naturally in ways that help Google robots and human readers know what the page is all about. Edit carefully, then make it live. Now it’s time to promote. Here are the traffic-driving basics. Send an excerpt (teaser text) of the article out as an email newsletter. Share it with your social network many times over the next few days and weeks. When you share, mention the super specific people who are most likely to love it. Link to the article from older articles and related pages on your website. Use the target keyphrase in the text of the links. Here are more tips for internal linking. Ideally, you’ve been building your email list and social followings all along. If not, that’s ok. Those things are very very helpful, but not necessary. It doesn’t take long to see if your page is ranking. Give it a few days, log out of any Google tools, then search for your phrase. Congrats! You just increased your targeted traffic. Check your Analytics to see how much traffic you’re getting and how engaged those visitors are. You may have targeted a phrase that is too competitive for your site. But you might try editing the article to better indicate it’s relevance for the keyphrase. (step-by-step instructions here). Create a few more internal links from your existing pages. Improve the quality somehow. Ranking on page three or lower? This is a slow way to increase targeted traffic, but it’s the main reason why some sites get much more traffic than others. When it works, you’ve got a magnet for traffic. Rather than just a spike of email marketing and social media traffic, you’ll get a steady stream of targeted visitors to the page from search engines for months or even years. It’s hard work. But in the long run, it’s a lot less work than pumping out a steady stream of semi-relevant, short-lived posts that never rank. It’s worth the work. If you try this and you don’t see results. The more you publish on a narrow set of related topics, the more likely your site is to rank. Target related phrases, publish in different formats and collaborate with influential co-creators to create a central hub with spokes of content (one more bike reference!). Guest blogging is a legitimate way to create a press mention (and link) on a credible website. It’s a powerful but sensitive tactic that starts with empathy for the needs of the editor and their target audience. When used properly, a high-value article is published in your name on another site and potentially links back to the in-depth article on your website. Remember, you’re an expert in your field. You have answers to questions that people are asking right now. You can publish information that people are searching for right now. Target that traffic. Write and publish authoritative articles. Align them with keyphrases. Indicate the relevance. The main difference between high-traffic and low-traffic websites? Rankings and relevance! Feel free to share your own advice and experience with other readers by commenting below. So often we wrongly flip that around. I’m gonna keep this little snippet for future use when explaining why blog post content must be relevant. Glad you liked that point, Matt. Content that only indirectly relates to your business may not generate huge demand for you services, but at least it helps your audience. That really should be the mission of your company, right? It makes you relevant. Nice to see you here in the comments! Thanks for the post, I actually carefully looked at the analytics sites you mention too to see how his PoCampo site ranks compare to my own tights blog. I still have so much to learn. Same thing happened with me. Now, I also started looking carefully at the analytics. 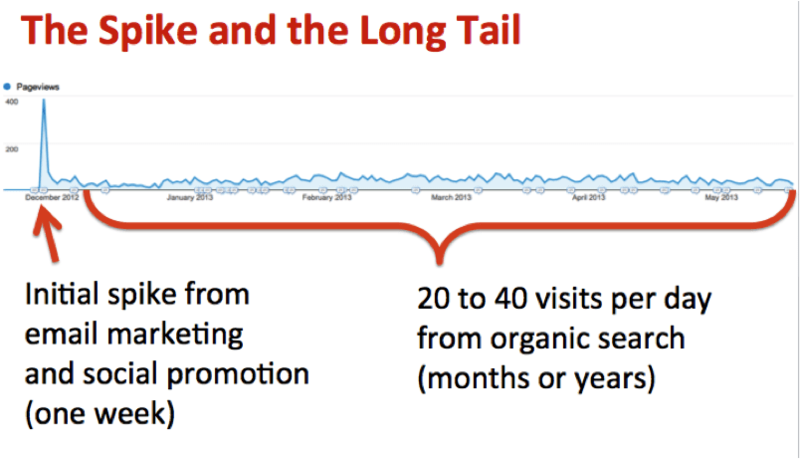 The Spike and the Long Tail graphic tells a story worth sharing over and over again. I appreciated the tight structure combined with rich linked resources. Since you left this comment, I’ve been thinking more about that image. I’m planning to use it a bit more now. Thanks for the nudge, Roger! Nice read Andy….especially points #4, 5 and 6…..you bet, a ton of work for sure but consistency over the long haul is what ‘stirs the drink’…..
Hey there, Mark. Nice to see you here! …yes, I truly believe that point #6 is one of the most valuable skills for any digital marketer. Real estate agents understand neighborhoods. Teachers know their students. SEOs know the competitive landscape. It’s all about context, right? I want to include photos amd images in my blog posts. When you want an image, what’s the first place you go to? Do you have design ideas you use as guidelines to help you figure out when to add photos and how to use them? Do you know, you can download free Shutterstock images from Facebook Ads. 2. While creating your Ad unit, select Shutterstock image for your Ad. 3. Open it as a full image and right click and download. Do your own photos if you can, the more personal it is, the more people relate to you. Another informative post Andy. I was sharing some of these tips with a client today. I owe you when I’m back in Chicago! Don’t come to Chicago without letting me know, Adam. Don’t come to the midwest without letting me know! Okay, this has made me rethink our current approach of just throwing something up on the blog every Wednesday. I can definitely see how the extra legwork would pay off. I’m wondering how often we should aim to post content of this caliber? We’ve been posting weekly to maintain a regular schedule on our blog, but I think we’d struggle with doing that if each post took so much more effort. If we trade-off frequency of posting for quality of posting, will we lose anything in bringing traffic to our site? PS// Thanks for using Po Campo as your example, gave me a headstart! Maria! Nice to see you here. There are a lot of other factors, especially “authority” But generally speaking, yes this should mean that you have a shot. All things being equal (although they never are) a page that is more focused on a phrase will perform better in search! Andy, i really liked your article. It’s every insightful. 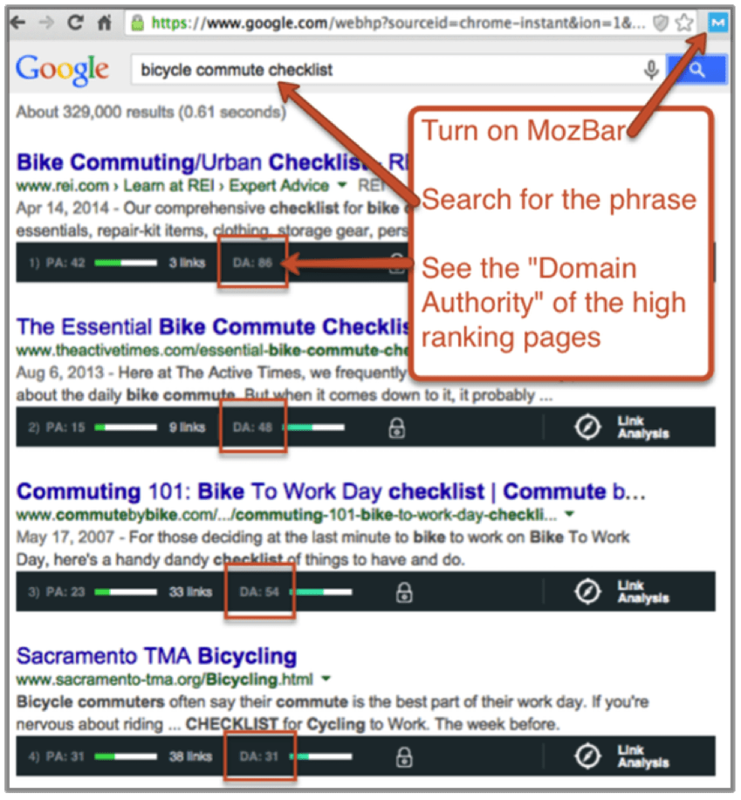 I really liked the strategy of measuring the competition of the keywords by installing MozBar. With the discontinuation of Pagerank, domain authority has become an important metric to measure the blog’s influence. I also didn’t know that in GKP the competition refers to ad keywords. Thanks for mentioning that. Great share, however I still got difficulties to rank my pages though I’m almost done with your tips. My posts/pages are still far away from top 10 Google page. I have tried to share my contents through social media, but it does not help much. Yes, my niche keyword phrases are categorized into medium to high competition if I check them via keywords tool beyond ad planer tool. I think to rank my posts are able to be done through back link, and sure I have done it. But it is just from social bookmark site and link profile. Thank you for the comment, Sara! It so good to get feedback like this. It means a lot to us, sincerely! I just started blogging recently and my ranking is only 1. Obviously I have a ways to go. I was wondering if this article is relevant to me at this stage in terms of steps 4-6. It’s good that you are thinking about SEO now, not later. Build your blog properly for SEO, it will help you to drive audience. This post will definitely help to those really frustrated in optimizing the traffic according to google web master’s guidelines. I have a question that if the meta keywords are not bold or h1, h2 in the title of the content, how possible by it could impact in keyword rankings and traffic exposure? Thanks! Hi there, Black Jack. It’s important to make sure your target phrase appears in the meta description and title tag. These places can’t be formatted with bolding, but it doesn’t matter. The H1 can be bold but this also doesn’t matter. I will try this method. It looks good for my website traffic exposure. Andy…keyword research gives me hives. This is the most human approach to it I’ve seen, and I want to read it over and over again until the rash subsides. It’s so great to see you here in the comments, Paige! If I can do anything to help you, just say the word. Thanks again For sharing this wonderful information! This article has many insights. I was unaware that the competition rating should be ignored. I always assumed it was for the business or marketer to decide weather to target the particular keyword. Thanks for the insight in this very thorough article. SEO is part of digital marketing. When it comes down to getting top rankings, write quality content and actively work on getting links. 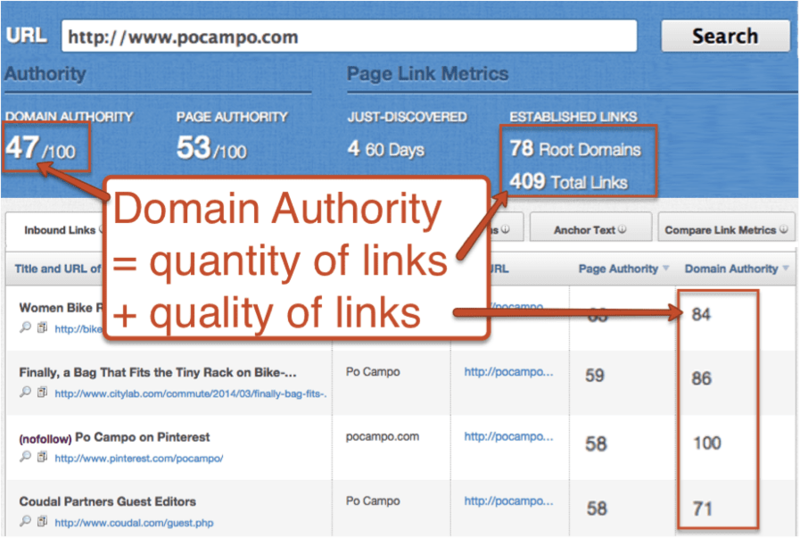 In terms of links, most important is number of links with the proper anchor text from authority sites. After reading this article, I just figured out I have to go back to the drawing board. I’m now considering publishing less articles in order to publish high quality posts. I can’t believe I read the whole article, after going to moz, I came back to continue and finish the article. Truly amazing post.